Paul Hughes of Western Signs & Printing has been in the signmaking industry for over 20 years, but he has another passion, too: steam trains. In his spare time, Paul is Chairman of Telford Steam Railway, a heritage railway run by volunteers. 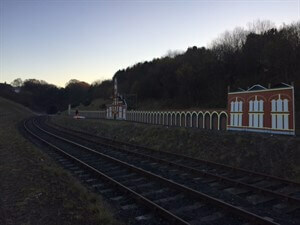 The railway relies on paying visitors to keep it running, so they are regularly looking for ways to attract more people to the railway. 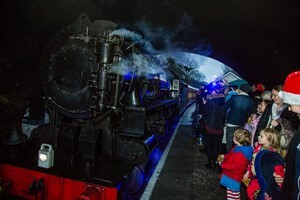 When on a trip to America, Paul visited a Christmas event based on the film Polar Express that he thought they might be able recreate at Telford Steam Railway. 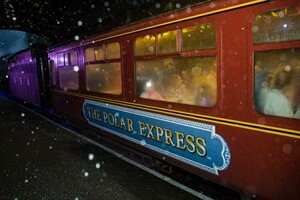 After four months of licensing negotiations with Warner Bros and their representatives, and securing use of a steam train that was as close as possible to the one that appears in the film, Telford Steam Railway signed a contract that would allow them to run an official Polar Express-themed Christmas event in the UK. 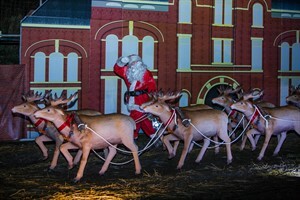 Conscious that attention to detail and quality would be key to the event’s success, Paul set about designing the scenery to create a Polar Express North Pole winter wonderland. He began work on the project in July, and after watching the film over and over again, referencing the original book of the story, and putting in more than 200 hours of design work, they were ready to start printing the graphics in September. 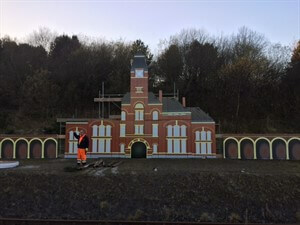 The majority of the print required was for the scenery that ran along each side of 70m of track along which the steam train would run and to provide a backdrop . 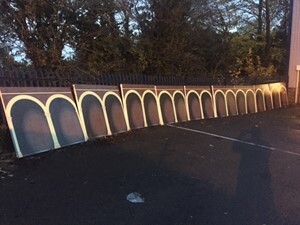 They needed to source a product that would print well, withstand British winter weather and – because they needed to print 400m of graphics in total – be reasonably priced. As an independent tutor at the Antalis Antalis Academy, Paul is familiar with many Antalis products. After exploring a number of options, he opted for Coala Frontlit Standard, a banner material that is tear and fade resistant, and REACH compliant, so ideal for the project. Paul also applied Coala 1d to Correx board from Antalis, to create signage for the event. Print: 400m of Coala Frontlit Standard was printed on a Roland RF640. Because so much material had to be printed, and because it had to be fitted in and around Western Signs & Printings’ other work, they ran the print at night – a 50m roll of material was loaded each night and left to run. The Roland RF640 has dual cartridges and so when the first cartridge ran out, it automatically switched to the second cartridge. The reliability of both the Coala Frontlit Standard and the Roland RF640 meant that they had no issues during the unmanned print process. 50m of Coala 1d, used to wrap 4mm white Correx to make the event signage, was also printed on the Roland RF640. Fitting: The Coala Frontlit Standard was hemmed with hemming tape, before being stretched over a wooden frame and stapled in place. Tip: Julia Hughes from Western Signs & Printing commented that they were mindful of stories in the press about Christmas events that had failed miserably, and were determined that their Polar Express event would be a success. Julia advises: “Know what you want to achieve and stick to it. Don’t take shortcuts. Don’t lose sight of the detail and the end goal”. The Polar Express Christmas event was a huge success, with 14,500 people visiting the attraction in the run up to Christmas 2016. Building on the success, Western Signs & Printing have worked with Telford Steam Railway to put the event on again for 2017. Ticket availability was increased to 20,000 which had sold out by September 2017. Tickets for 2018 are expected to go on sale in March 2018. For more information, visit Telford Steam Railway’s Polar Express website. Coala Frontlit Standard is 440g laminated PVC banner material ideal for creating frontlit banners and billboards. Coala 1d is a monomeric vinyl suitable for short to medium term indoor and outdoor applications on flat surfaces.